The Economist magazine published this cartoon trying to joke with Vladimir Putin and new Russian imperial advance. In fact the caricature became popular on the Net and was shared thousands of times on Facebook. Obviously it looks like the next of the many propaganda moves, as at current moment the West can oppose Putin only propaganda. But the most important fact about this picture is that is deeply untrue. This breaks the basic principle of political cartooning – to base the idea on real facts, and just to make them look funny. Building a cartoon on false facts is nothing than an unfair manipulation. In 1940s Russian bear is shown being in trouble. In fact the trouble is real, but not due to Russian guilt. These were the years of World War II. Almost the entire world was in trouble. But especially in the economy it marked and enormous growth – due to military expenses. So even before the mid-1940s, Russia has become a major economic and political power. It not only crushed the Nazis, but also that occupied half of Europe. In fact the 1940s were the biggest advancement of Russian empire in its history. And on the opposite – 1940s are a total crash for the West. Germany was ruined by Nazis and by the lost war. France was occupied by Nazis. UK was suffering heavy losses. In fact only USA – as s major supplier of military equipment has made some profit. But even they accumulated problems it the area of government debt. In 1950s Russian bear is shown of restarting with a something like a post-drunk headache. But this again is not true. After the war there was a post-war recession that hit the entire world. 1950s are the beginning of the Cold War. Russia is strong and stable, and far far away from a problematic dopey bear. In 1960s Russia is stable under Nikita Hruschov and Leonid Brezhnev leadership. There are also some positive developments in relations with the West. In this time Russia wins the cosmic race. Over the world break socialist revolutions that are not financed by Russia. In fact it wins prestige of them. On the opposite, in 1960s USA start some of the most stupid moves in their history. They enter the Vietnam War and the utopist Great Society of Lyndon Johnson is started to be built. Using newly printed dollars for this, USA brings the global financial system (Bretton Woods) to a crash. French President De Gaulle withdraws as much gold as he can from USA. The official crash of the Breton Woods is announced in the beginning of the 1970 s.
This period is shown in the cartoon as the Russian bear starting to roar and attack the rest of the world. But this again is not true. In Russia 1970s are known as a period of standstill. Russian empire is focused on internal problems. In 1980s USSR really reaches to crash. But this is a crash due to a very long devolution and not due to a crazy dance over a tiny economy. In fact from the start of 1980s USSR is already very weak economically so it loses control over its satellites in Eastern Europe. No any expansion or roaring. 1990s are shown as the new 1950s – again a start of recovery after a big fall. But this is not true. 1990s are the years of the final crash of Russia during Boris Yeltsin rule. The economy is down. The political power is disintegrated. In Russia becomes the era of the oligarchs. It is funny this period to be shown as the start of the recovery. 2000s are shown at the new 1960s. And again this is not true. In fact at the beginning of 2000s is the start of the recovery. Putin is still a weak president. His prime minister is one of the Yeltsin’s elite. The oligarchs are still strong. Russia has no any initiative in these years. On the opposite – these are the years of the uncontrolled money-print in USA and inflating market bubbles. These are the years of the anti-terror war of USA, expanding the secret agencies and occupying Iraq and Afghanistan. 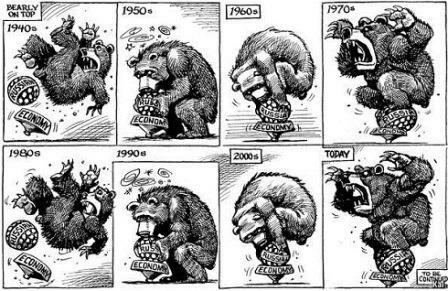 And final part of the cartoon shows Russian bear again roaring. So what we have to expect next? Obviously - a replay of 1940s and 1980s. But as we have seen, these instances were not true. Today Russia is not roaring. The Crimea case is much less aggressive than the West invasions in Libya or in Yugoslavia. In Crimea Putin was involved without having other choice. But much more important is something else. Russia is very stable economically now. It has enormous reserves and a symbolic debt. Russian invasion in Crimea is not an expensive one. It was almost bloodless and with no real battles. So Putin losses nothing. This is not a threat for Russian economy. In fact Russia squandered much more money on efforts that were positively accepted from the West – for instance the financial aid for Ukraine, just before the fall of Yanukovitch. In this case no one ironized Russia. The money was welcome and was not a “roar of the bear”.